The food night tour was great, however the heat/humidity wasn't making me hungry as much. My tour guide was Golf, and he was great at getting me to try the different traditional Thai dishes besides pad thai. I would recommend this tour if you are a foodie like myself. The tour guides were super spoke some English, took us threw china town food could have been better not to mention we wanted Thai food. Much to pricey three of us could have ate for days on what the tour cost.....would not recommend head out on your own and explore. We loved this tour. Our guide Golf was really friendly and provided a nice little walking tour with a history lesson before we sampled food. The variety of food was excellent and we felt like we had a really nice sampling. We also enjoyed the Tuk Tuk ride and the drinks on the roof top at the end of the evening. Excellent tour! Our tour director Lian was the best! Her and the Managing Director Thanauwut Supangkaratana were fantastic. They made my wife and I feel like relatives! They showed us great sights and we had a fun time. I would highly recommend your tour company to everyone. This tour through China town was really excellent. Our guide Good was great! No one else joined our group, so we were able to tailor it to exactly what we wanted to do. Wandering through China town at night is an experience not to be missed. Neon lights that rival Times Square and one food stall after another full of diners. The sights, smells and sounds were a cultural experience in themselves, and the food was amazing! Fish maw soup, Chinese pad thai, pepper soup my personal favorite, dumplings in ginger tea and some amazingly delicious comfort food with condensed milk for dessert! It was really a great experience and not to be missed. Really friendly and informative guide. He took pictures of us with his professional camera and then sent them to us a few weeks later - really nice that we could be together in all the pictures and also have higher quality photos. 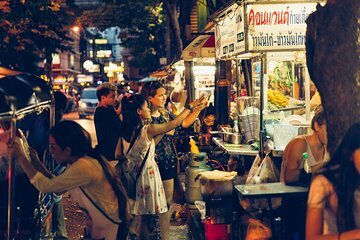 The food was interesting and delicious, overall a very fun tour, would definitely recommend to anyone that is food adventurous and wants to experience the Bangkok food scene ore from a locals' perspective. We had delicious food experiences and our hosts were knowledgable and great company!